CAD Forum - Double-click to edit raster images in DWG drawings. With a simple utility and a small edit of your menu you can edit raster images attached to your DWG files - directly from AutoCAD. The standard function assigned to double-click on a raster image is IMAGEADJUST. But you can change it right to launching a raster editor of your preference - e.g. PhotoShop, CorelPAINT, IrfanView, Paint, etc. The first assumption is the freeware LISP utility ImgEdit - download it from www.cadstudio.cz/download and drag it to the briefcase icon in the dialog of the APPLOAD command - this will ensure it will be loaded in every DWG drawing. This utility defines the command IMGEDIT, which we will use in the menu. Run the CUI command and in the left bottom pane create a new command "ImgEdit" and assign the macro ^C^CIMGEDIT to it. Then drag this new command up to the tree branch "Double-click actions > Image". Confirm the dialog with OK.
Then just double-click on any image attached with IMAGEATTACH in your AutoCAD session. 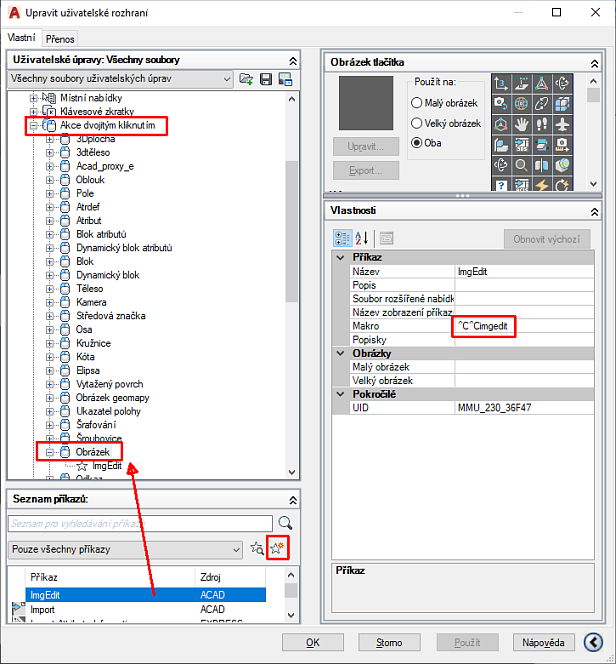 This will automatically launch the graphic application associated in Windows with the given type of raster image (IrfanView in our case) and unloads (frees) the image for editing. Then save the edited image in your image editor and exit the application. AutoCAD will automatically reload the edited image back to the drawing. You can modify the LISP file to launch a predefined graphics app. The mechanism used in this LISP application can be also used for similar tasks requiring to start an external .EXE application and wait for its completion. Tip 12214: How to set bitmap transparency in an Inventor drawing. Tip 11790: How to get a hi-res image of an Inventor assembly (for a brochure, billboard...)? Tip 11159: How to load an ECW v3 format image in AutoCAD? Tip 9698: Data formats supported in Autodesk InfraWorks 360. Selected tip: Automatic Purge for nested blocks or other symbols.